Pie or cake? Have both! 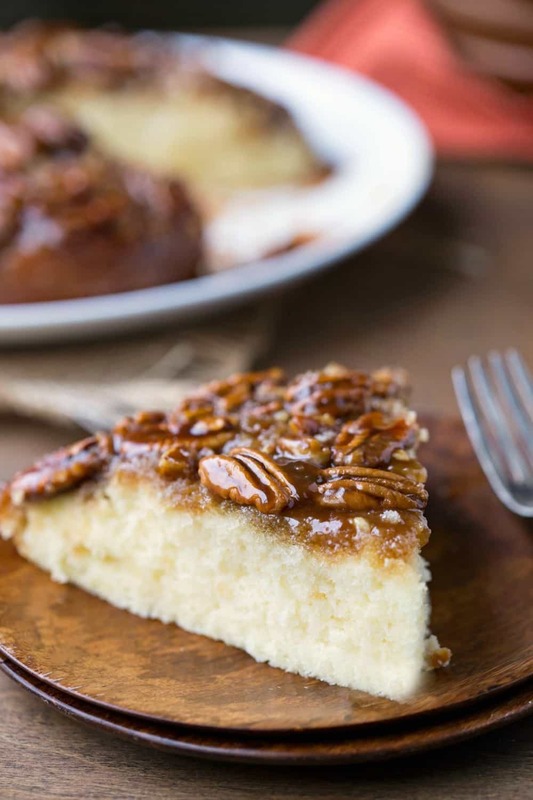 This Pecan Pie Upside-Down Cake recipe is the best of a light and tender cake and deliciously sweet pecan pie filling. I am a cake-lover in a family of pie-lovers. When Thanksgiving rolls around, everyone else is looking forward to pumpkin pie, apple pie, and even mincemeat pie. But not me. I’m all about the cake. I actually love pie fillings. It’s just a crust thing. I can’t get into a plain pie crust. So, I swapped out the crust for light and tender vanilla cake and kept my favorite part of my favorite pie. This Pecan Pie Upside-Down Cake really is fantastic. The topping alone is worth making the cake for. 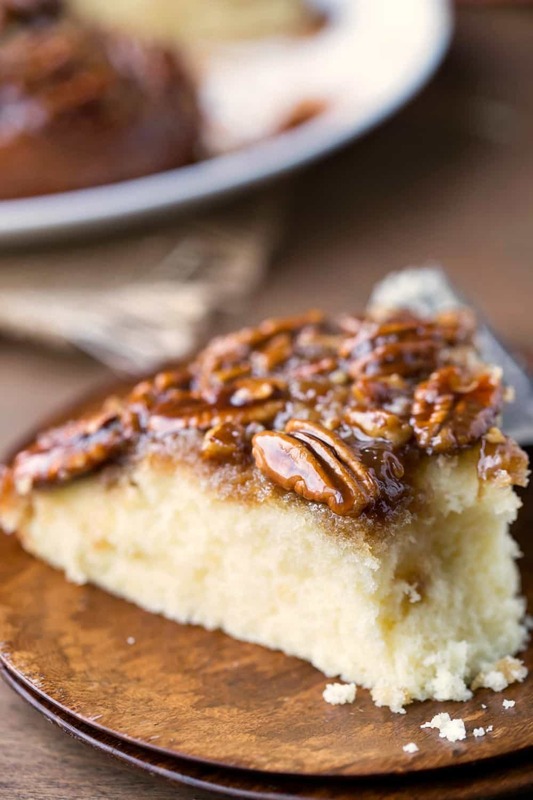 It’s sweet and perfectly sticky like pecan pie filling. It will be right at home on your Thanksgiving table and is the perfect dessert option to end any pie vs. cake issues! 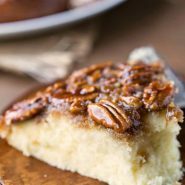 This Pecan Pie Upside-Down Cake recipe is a light and tender cake and delicious sweet pecan pie filling. 2 T. heavy whipping cream. Preheat oven to 350F. Grease a 9-inch round cake pan. In a large bowl, beat together butter and sugar until well-combined. Scrape down sides, and add eggs one at a time, beating well after each addition. Mix in buttermilk and vanilla. Stir until just combined. Set aside. 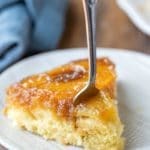 To make the topping, stir together butter, brown sugar, corn syrup, and whipping cream until well-combined. Gently spoon batter over pecans. If you pour it in, it may push the pecans in the middle aside, so gently add the batter on top of the pecans. 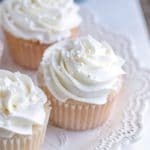 Bake for 35-45 minutes, or until a wooden toothpick inserted in the center comes out without any cake crumbs. Run a knife around the edge, and then invert cake onto plate. I’d like to make this for thanksgiving. Should it be served immediately or can I make it earlier in the day? Thanks! Could I make this in a 9″ spring form pan? Or it’s best in a 9″ cake pan? I haven’t tried it in a 9-inch springform pan. A 9-inch springform is a larger pan than a 9-inch cake pan, though, so you would need to adjust the baking time. Good luck! Was I supposed to let it cool before taking it out of the pan? I didn’t see that in the instructions, but when I inverted it onto my place the liquid in the topping all ran off. From your picture it doesn’t look like your did that? I’m sorry to hear that! I don’t let it cool because it sticks to the pan as it cools. I just let it sit long enough to run the knife around the edge. I have had to replace a few pecans that stick, but I’ve never had the topping run off. How thick was the topping when it was in the pan (before baking)? It thickened quite bit as it cooled, but it was too late because the topping had run all off because I removed it from the pan approx. 5 minutes after taking it out. It was runny enough that it spread around the pan when I first put it into it before baking. Maybe it wasn’t thick enough? The pecans were fine on top. It tasted delicious though! I just wish the topping hadn’t run off. Can I make this in a 9/13 pan. 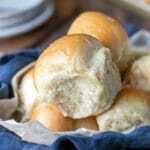 How long to bake? I haven’t tried to make it in a 9×13, so I’m not sure how it would work or how long you’d need to bake it for. If you try it, I’d love to hear how it comes out! This turned out amazing, I wasn’t sure I’d be able to stop my husband from eating it all.